Daisy and Minnie at Epcot! 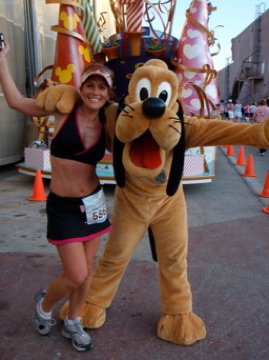 If you have never ran one of the runDisney 5k's ..I would suggest registering ASAP!! 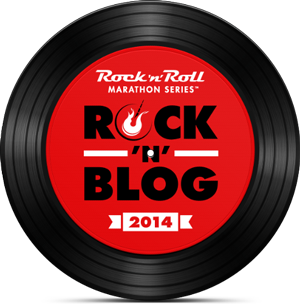 Seriously, as much as I love running the Half Marathons and Full Marathons...I love the 5ks just as much! These races are a great way to get a glimpse into what one of the larger races are like. 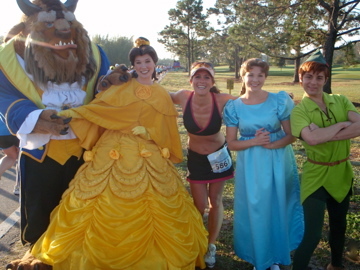 Packed full of characters along the course and the shorter distances make these runs soooo appealing! 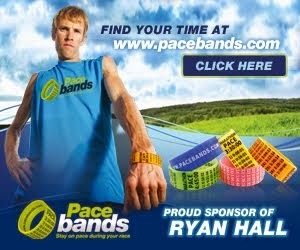 Because I run all of the long distance races, I love using these as a "warm up" for the long races. 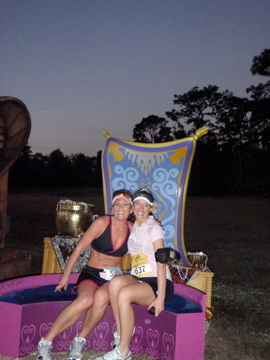 Not to mention, they are themed as "family" races so there is no timing chips and are a little more relaxing. There is a time limit to finish but easily attainable for kids and families. Early morning at the Start Line! Run by the front side of the Geosphere...first time to do that! aaaahhhh!!! So.... as many of the RunDisney races that I have ran, this 5k was the first time I had EVER ran in front of the Geosphere at the front gates of Epcot! 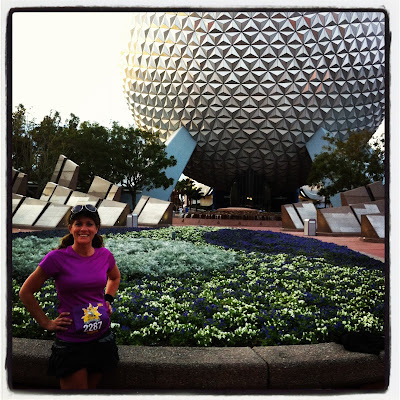 I had ran in front of the Castle numerous times, in front of the Tree of Life in the Circle of Life 5k (2009) with my kiddos, and in front of the Sorcerers Hat in Hollywood Studios but this was a first for Epcot!!! 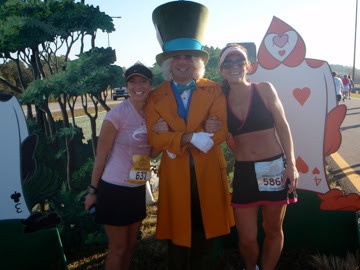 I love that the 5k's can bring surprises that you would never expect. 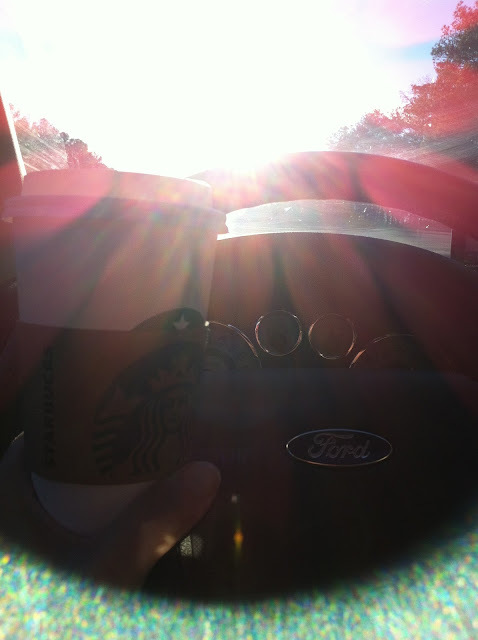 One of my favorite moments of the day! Caught up with Race Director John Hughes...seriously, the nicest guy! Finished with some of my BFFS! 1. 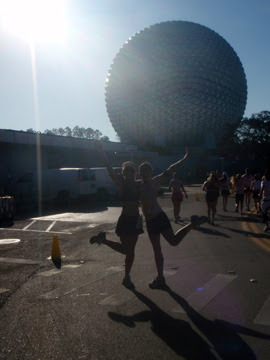 )It's a RunDisney event...NOTHING better. 3. 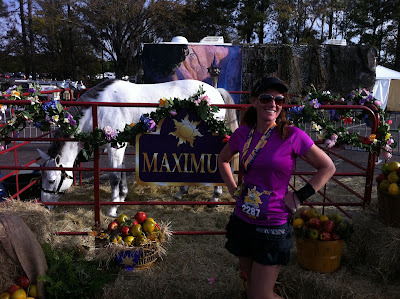 )Shorter distance..not wearing myself out for Princess Half the next day! ﻿4. )Cool Bling with friends..Love it! 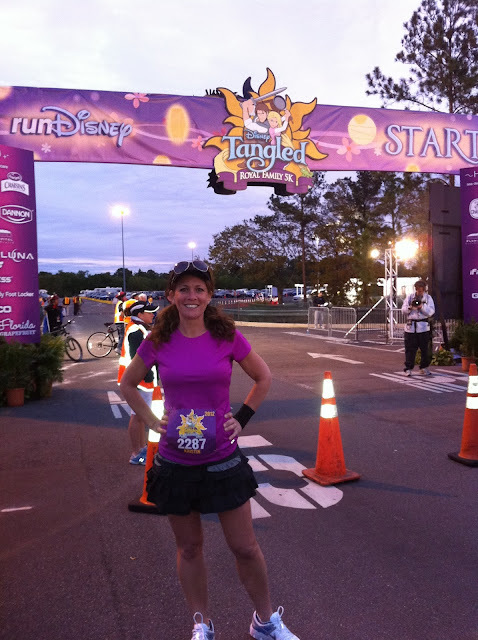 Make sure to check out RunDisney.com and get registered for a 5k soon! I'm running the "Mickey and Minnie" themed 2013 Royal Family 5k and I can't wait!!! I've got some polka dots planned to wear...embracing my inner Mouse-ness! 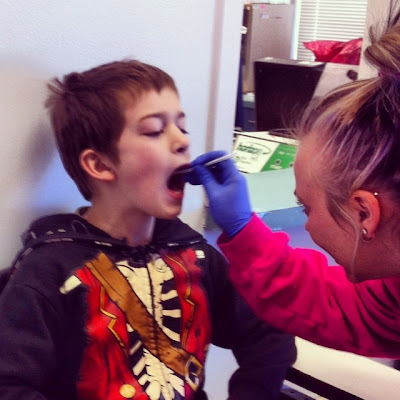 Here's to a Healthy Monday! It seems like most days we are moving along just fine at my house and then...WHAM! Everyone comes down with something. 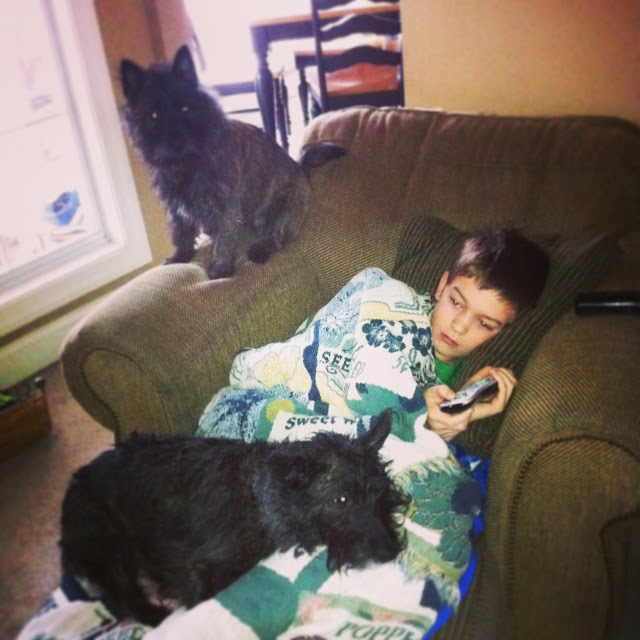 That's how we spent this weekend... My little man stayed home from school Friday complaining of headache, sore throat, fever. My middle one stayed awake all night Friday night with fever, coughing, wheezing and couldn't breathe. 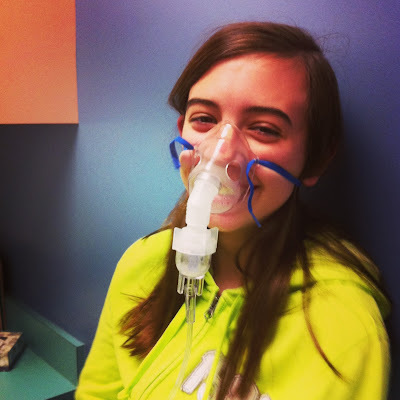 She's got asthma pretty bad. 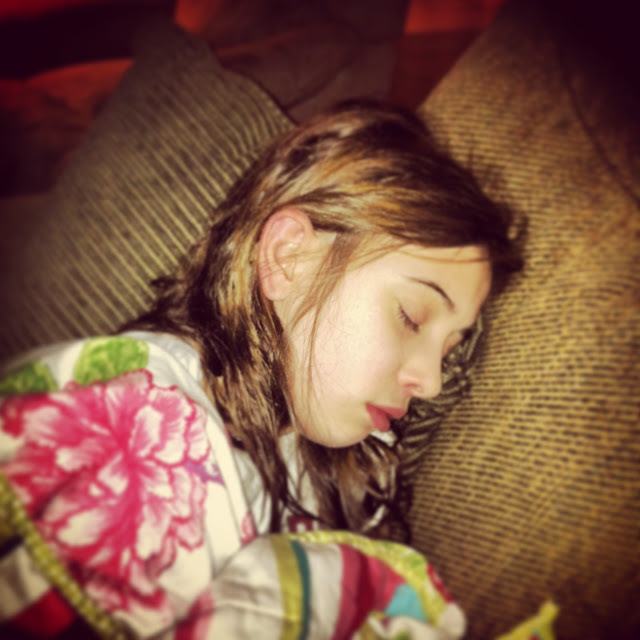 Alyssa home from school and asleep on the couch for the night by 6:30pm! Yikes! 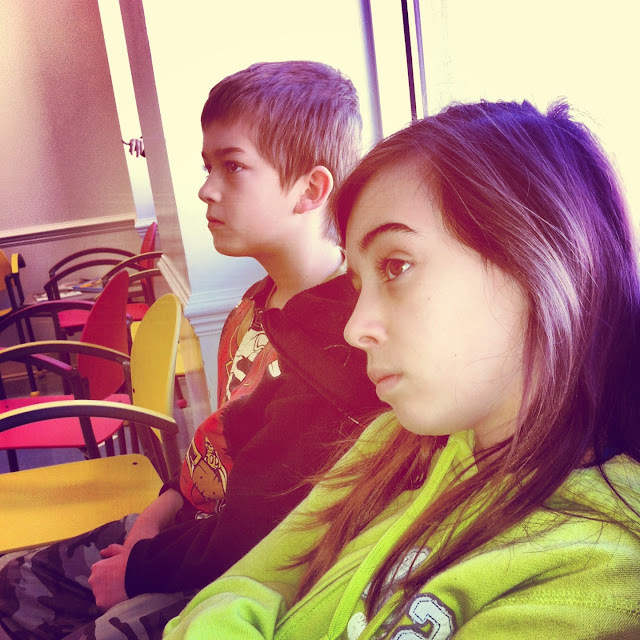 Waiting to see the Dr....NOT happy about spending our Saturday this way. Her meds and nebulizer making nutty! 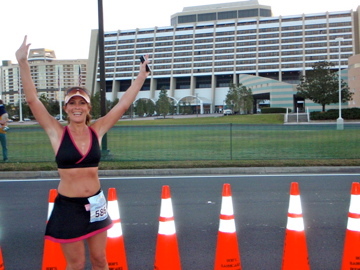 A Look Back at the Inaugural Princess Half Marathon! It's a BRAND NEW RACE and this Princess Has Arrived!!!! 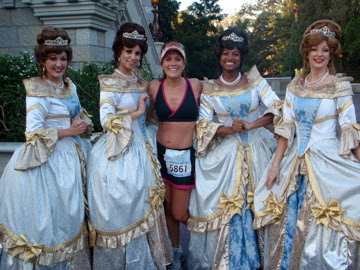 Running through the Castle at the Inaugural Princess Half Marathon! 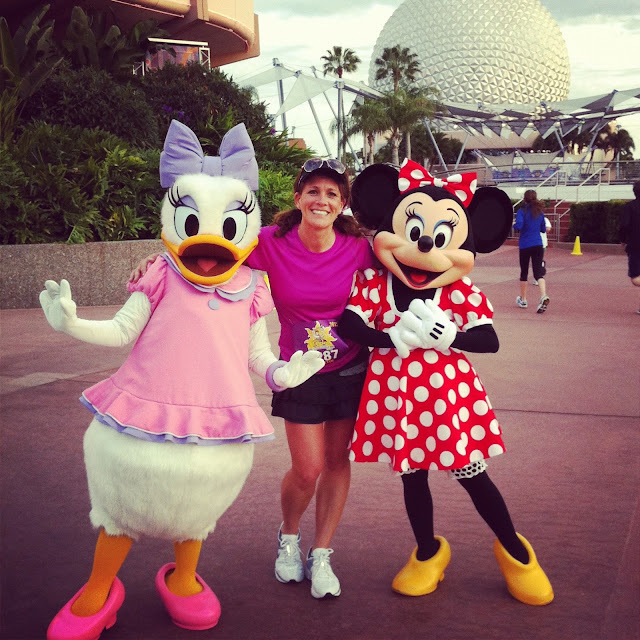 It all started back in 2009 when I ran my first Half Marathon at Walt Disney World. 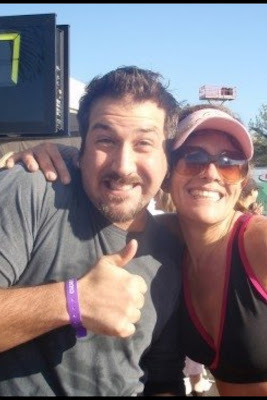 I had trained SO Hard and was SO nervous to run my first Half but when I actually started running my race and realized that this was going to be the most fun thing I had ever done...ALL worries went out the door! 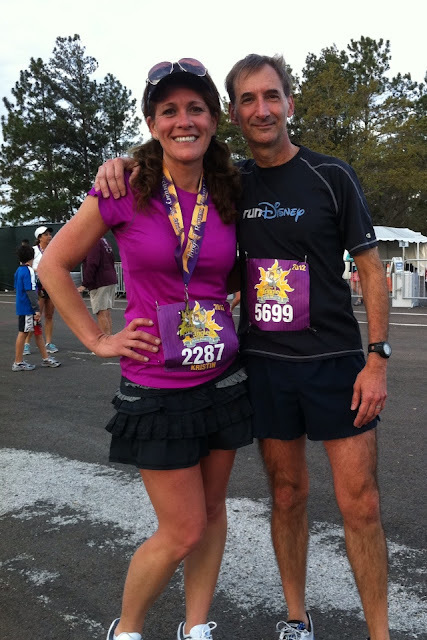 When I say the words "Runner's High", well that doesn't even come close to how I was feeling after running the WDW Half! I knew at that very moment with my Donald Duck Bling around my neck, I would always be a Disney Runner. 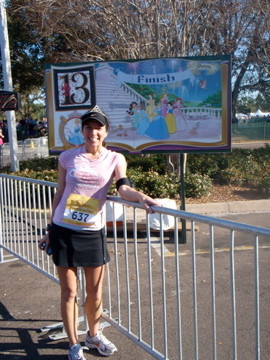 Enter Princess Half Marathon. What?!?! There's a Princess Race too? It's the first one?? Sign me up. And my sister, my mom, my Dad and my brother in law. 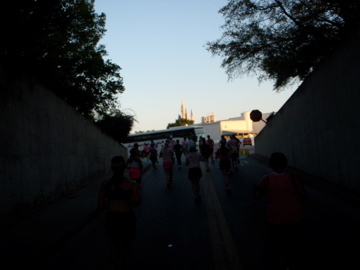 (At that time we didn't really realize it was a girls race). 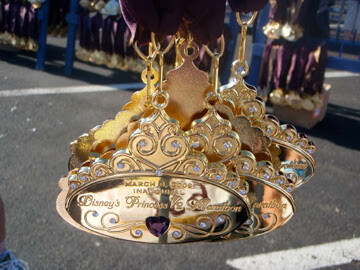 11,000 Runners were expected to run during the Inaugural Princess Half Marathon Weekend. WOW have things changed since then?!?! This race has Doubled in size! When I saw this Princess Sneaker on a Royal Pillow, I knew this was definitely the race for me!!! 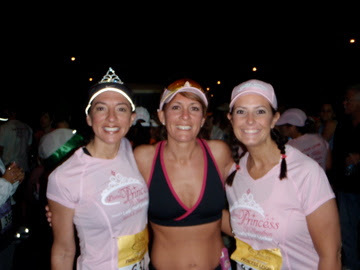 LOTS of Princess shopping done at the Expo.....Ready to RUN!!! 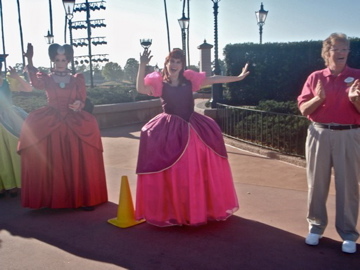 Running into the Castmember entrance of Magic Kingdom! 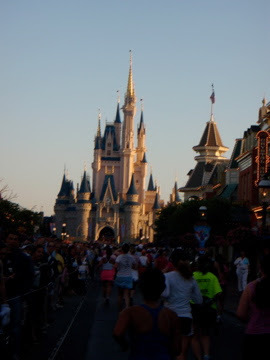 We turned the corner and we were running right down the middle of Main Street USA!! We've made it to the Castle! Best EVER!!! 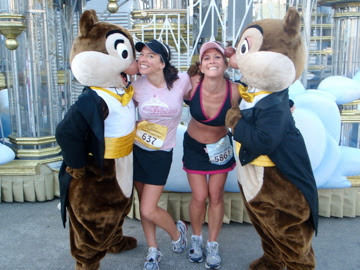 Smooches from Chip and Dale! Pluto in front of the Float from the Move it, Shake it, Celebrate it parade! 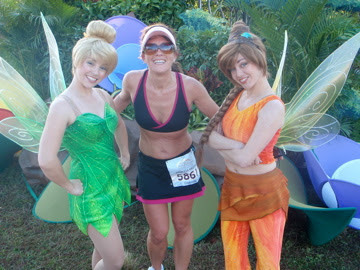 Tinkerbell and the Fairies of Pixie Hollow....Who knew just a few short years later that Tinkerbell would want her own race?!?! 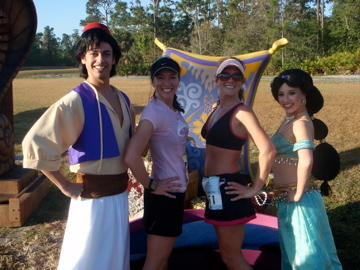 Aladdin and Jasmine striking a pose! OMG!!! We've made it back into EPCOT!!! We're almost finished!!! 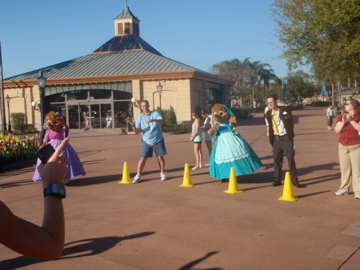 Cinderella's Mice and Castmembers pointing us to the Finish line. 13 Miles.....We're coming up on the Finish line!!! Got a Thumbs Up from Joey Fatone at the Finish Line! Thanks Pal! 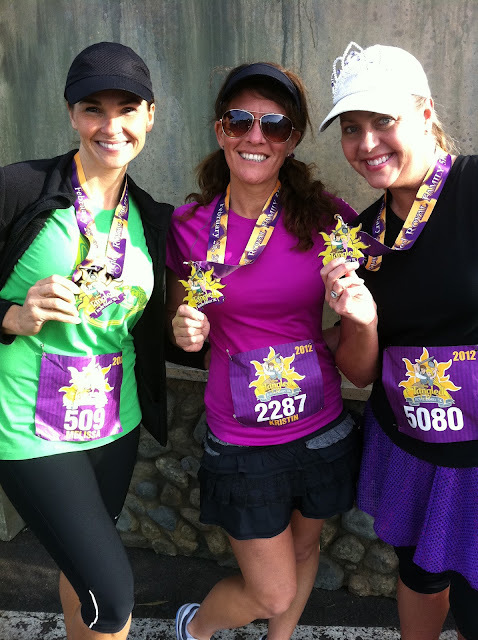 Getting sprinkled with Pixie Dust as soon as I received my Gorgeous Inaugural Medal! Aaaaaahhhhh the Bling! It's So Beautiful and Shiny and ALL MINE!! 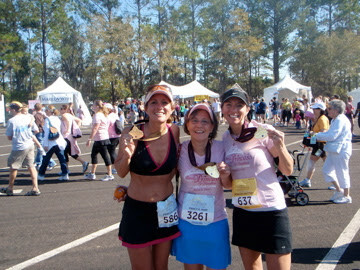 Finished with my Mom and Sis....Princess Bling in the Family! The race was Amazing, the Bling was Amazing and I knew immediately after this race was over that I would ALWAYS run this race! We made a pact that year that we would block out "Princess Weekend" on our calendars for the next...ummmm....like forever? Yeah that sounds good. 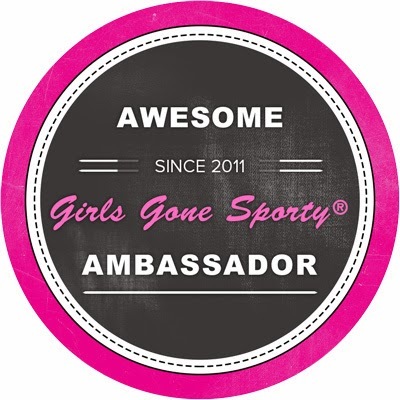 I'm hoping to be able to run this race with my daughters and their daughters. We have completely embraced our "inner Princess" and are "Perfect Princesses". Thank you RunDisney for creating such a fun event for my sis, family and friends to be able to create a lifetime of Princess Memories! 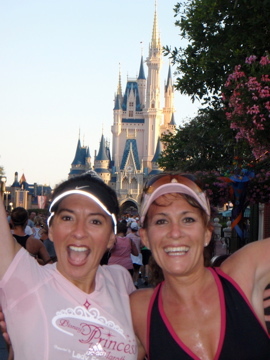 Don't forget to check out RunDisney.com for all of the updates on future races at Walt Disney World and Disneyland!